The apparent next commander for U.S. Forces Afghanistan appeared before senators Thursday to face the same old political fights over troop withdrawal plans for the fight there. Lt. Gen. John "Mick" Nicholson Jr., currently commander of NATO's Allied Land Command in Turkey, was formally nominated to take over the Afghanistan role less than a day before his confirmation hearing, an unusually quick turnaround for the process. 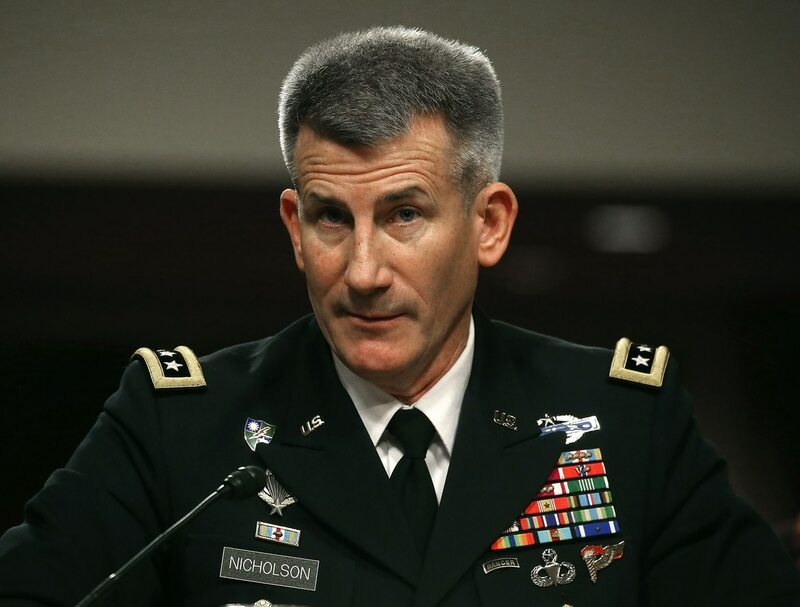 Nicholson would succeed Army Gen. John Campbell, who is expected to retire. Officials from the Senate Armed Services Committee said they've been planning the hearing for several weeks, in part because of the importance of the post and its oversight of the now 14-year-old conflict in Afghanistan. Nicholson said he has seen significant progress in recent years, as U.S. troops have shifted from a wartime stance to a dual mission of training local allies and conducting counterterrorism operations. But he also warned that despite the advances of Afghan troops, "in some areas they still have years to go." Those comments provided fodder for committee members — both Republican and Democrat — to criticize White House plans to draw down American forces in Afghanistan by the end of the year. 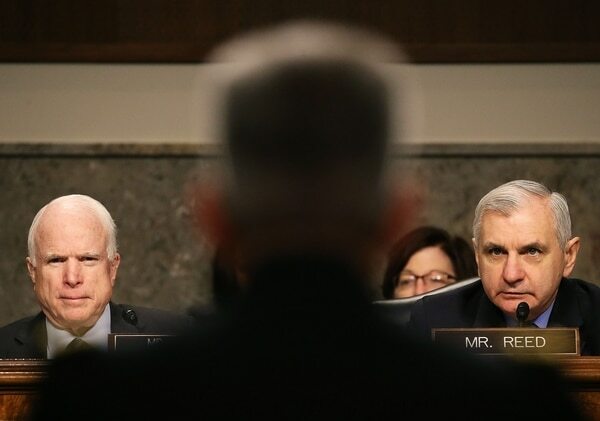 Senate Armed Services Chairman John McCain, R-Ariz., left, and ranking member Sen. Jack Reed, D-R.I., listen to Lt. Gen. John Nicholson Jr. speak during his Jan. 28, 2016, confirmation hearing in Washington. Currently about 9,800 service members are stationed there, a larger presence than President Obama had promised four years ago. But last fall, in response to concerns about Taliban advances and instability in the country, Obama announced plans to keep a U.S. military footprint there into 2017, to prevent "deterioration" of regional security. Administration officials still plan to almost halve that troop presence by Jan. 1. Senators blasted that plan as dangerous and shortsighted, and peppered Nicholson with questions about the wisdom of a too-small fighting force. "As the security situation in Afghanistan continues to deteriorate, it makes no strategic or military sense to continue the withdrawal of American forces," said committee chairman Sen. John McCain, R-Ariz.
"It is time to immediately halt U.S. troop withdrawals and eliminate any target date for withdrawal. That will allow American forces to perform the vital tasks of eliminating terrorist threats and building the capacity and capability of Afghan military." Sens. Joni Ernst, R-Iowa, and Joe Donnelly, D-Ind., both suggested that more troops may be needed in the region to ensure long-term security, not fewer. Sen. Dan Sullivan, R-Alaska, asked whether Defense Department officials should consider a permanent deployment force in Afghanistan, similar to the military presence in South Korea. Sen. Kelly Ayotte, R-N.H., said too-fast drawdowns could cost American lives. "What worries me is that we're taking on more risks," she said. "We cannot afford to take on risks that allow a safe haven again for al-Qaida." For his part, Nicholson dodged specifics, saying he needs at least three months in the new role to properly evaluate the mission needs and risks for U.S. troops in the country. He offered support for the administration's general strategy in the region but pledged to offer honest assessments on levels needed for troops and equipment. He said a hypothetical plan to drop force levels to fewer than 1,000 troops by January 2017 is too dangerous, but deferred on plans for 5,500 troops in country at that time. Nicholson also acknowledged that those troop level decisions will require military planning in late spring, to prepare commanders for operational changes. "My priorities are to protect the U.S. homeland, and to enable Afghans to secure their country," he said. "We do need to think about an enduring commitment to Afghanistan. The level that will require is where I hope to provide my military advice." McCain said he hopes to have a full Senate confirmation vote on Nicholson sometime next week.